The next morning, Sunday, was an early one as we were due to be at the Church at 7.30 to receive the nearly 30 people, mostly kids, joining us for a hike to a beautiful waterfall up in the Andes. 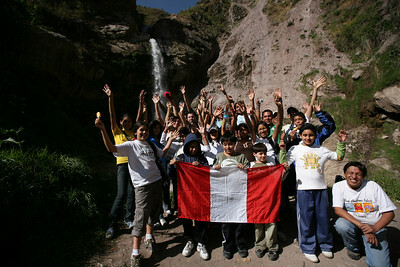 This was the inaugural event for the Peruvian DiscoveryBound Chapter started by Giorgio and Brenda. I met with Giorgio in January when I was last in Peru and gave him one of the DB Handbooks. He had been working to energize the Christian Science youth base by teaching Sunday School and providing Sunday School Challenge events beyond the classroom. DiscoveryBound brought the structure he was looking for and the support he needed to take it to the next level. At 8.30am, the small bus Giorigo rented pulled away from the church and the waiving parents. Some of the parents took some comforting to allow their children to come on the event and Giorgio did a great job taking care of the details, including translating the DB permission form into Spanish. Permission forms are pretty unheard of in Peru, but it did provide some comfort to the parents that this was a serious and responsible organization taking care of their children. The Lima skies were gray, as expected, when we departed and once on the main roads, the lesson was passed around and read aloud by youth and chaperones alike. On the last section, Giorgio handed me the lesson and I gave a solid stab at trying to pronounce the Spanish words from Science and Health. Not to let Dave feel left out I handed the lesson to him to finish us up. I think the whole bus paid particular attention to the the two non-Spanish speaking Americans trying to read the lesson. An hour into the drive, we started to wind up mountain roads and the clouds dissipated allowing the sun to illuminate the mountainous terrain growing around us and to sparkle in the arcs of water spurting from the hoses all along the way wedged in a pair of rocks to shoot a stream of water into the air. This was advertisement for the large transport trucks to pull in and get themselves washed before they got to Lima. We finally arrived in the small town of Matucana around 10.30 where some sort of ceremony was going on in the central square complete with a full brass band and kids in uniform marching in a small parade. The VIP section of the parade onlookers only numbered about a dozen, but they were very proud of whatever this all signified. We watched for a moment, checked out the train station (because it was there), then headed up the trail. The small road rising out of town slowly tapered and just when we thought we wouldn’t get any more vehicle traffic (small three wheeled taxi carts, not to far from a rickshaw) we gathered the group to set some thought in motion. We reviewed some of the points mentioned in the notes from the practitioner that were read at the church and Dave provided some food for thought that the Link School in Colorado where he works had been working on. The structure Dave presented was “I was, and now I am” to get the group thinking about how this activity and bringing Christian Science into it affected them. Moving on, the trail narrowed to a single track, crossed a bridge and the steepness kicked in. The young boys were undaunted by this and shot up the slope like rockets. Others had a harder time with it and loving encouragement was provided by chaperones and youth alike. For one particular young man who had never done anything like this before, I sat next to him with the Spanish lesson and had him read to me something from the third section: “We must look where we would walk, and we must act as possessing all power from Him in whom we have out being.” (SH 264:10). This gave him some needed encouragement and I suggested he share the same quote with one of the girls struggling with “…possessing all power from Him in whom we have our being”. With a steady plod and constant support, we wove our way through the speckled green and brown folds of steep mountainside up the ravine. The slope remained steep, but the trail finally aligned with a contour and traversed to the crux of the deepest fold of earth where the waterfall flowed and carved the lush verdant land around it. A cool wind laced with the mist of the waterfall filled the rock chamber carved out by the waterfall and offered a pleasant reprise from the light perspiration forming on our brows from the climb. It wasn’t hot by any means, it is after all, winter here, but it was plenty warm. The kids and adults alike played with the shifting waterfall, sacked out in the gentle grass with lunch and purchased ice cream from an entrepreneurial fellow, who was not part of our group, that hiked up with an insulated cooler bag full of ice cream. After a group photo, we found a grassy spot to circle up and reflect on how we’ve grown and changed through the day. Everybody was asked to participate but they had the choice of speaking aloud to the group, or for those who didn’t want to speak, we provide pen and paper. Everybody provided some wonderful reflection on thoughts of not being tempted to be afraid, feeling and recognizing God’s protection and gaining new perspectives both visually on the trail and metaphysically from the love and conversation around them. The descent was easy and light footed. A few slips on the steep loose rock, but none that put anybody on the ground. The afternoon sun was picking up a golden quality as the shadows lengthened from our feet and the mountains. We settled on a sunny grassy pasture at the bottom and were covered in shade by the time the group had reassembled into a gratitude circle. Wonderful thoughts were shared, not by all, but by those who were moved to. Some of the students, who were either coming to Sunday School on an irregular basis or some the non-CS friends shared that they were keen to make Sunday School a weekly event in their lives. The bus ride home was quiet and we pulled in front of the church under darkened skies where eager parents were waiting to hear all about the trip and the rested youth did no hesitate to tell all with animated exuberance. Giorgio, Brenda and the other chaperone did a great job. There were also some young adults along who Giorgio spoke with and found they would be interested in helping run future events. We played a few camp games while we waited for the last few parents to arrive to pick up their kids and you could tell the youth never wanted the fun to end. 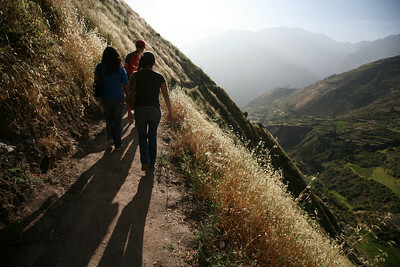 This entry is filed under: Blog, Earth, Hike, South America.